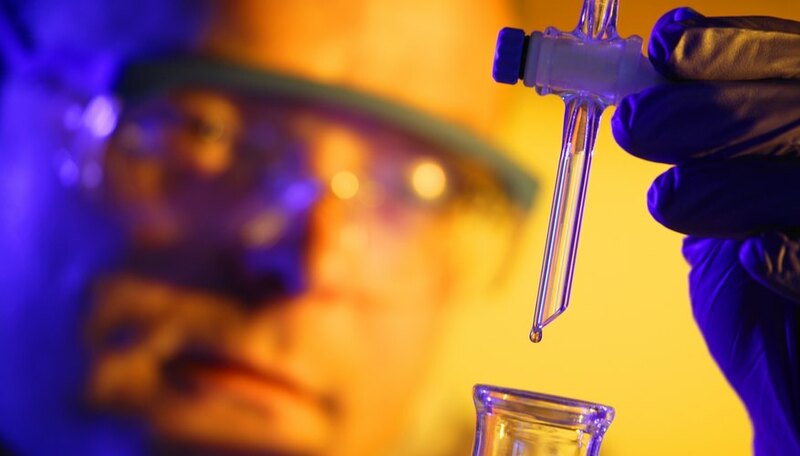 It may sound like something out of a science fiction movie, but infinite dilution is a concept found in chemistry that is applied to the study of solvents -- liquids -- and solutes, the substances that are dissolved in solvents. This principle is used to test the properties of solutions and extrapolate or estimate their chemical reactions in varying environments. Infinite dilution is also defined as a solution that contains so much solvent that when you add more liquid, there is no change in concentration. This means that no matter how much solvent is added to the solution, the properties of the solute -- the substrate particles -- and the system will not change. A study published in the journal Fluid Phase Equilibria defined infinite dilution as a solution in which each molecule of the solute is surround by solvent molecules only. This means that the solute only interacts with the liquid and has no contact with molecules of its own kind. Another definition of an infinitely diluted solution is one in which there is a large enough excess of water, that adding more liquid will not cause heat to be released or absorbed. The temperature change of a solution at constant pressure is called enthalpy in chemistry. Hence, a solution is termed to have an enthalpy change when one mole of an ionic substance dissolves in water to make it infinitely diluted. A mole of any substance is defined as 6.02 times 10 to the power of 23 atoms, ions or molecules of that substance. In chemistry, enthalpy change is indicated by the delta sign and a capital H.
The infinite dilution activity coefficient is also referred to as limiting activity coefficient. This number is a constant for different types of solutions and is used to calculate when a solution will reach infinite dilution. The infinite dilution coefficients have been calculated for various types of solutions and are available for scientists to use. Research published in The Journal of Chemical Dynamics in 2005 described one method for determining these values. The researchers used gas liquid chromatography, a method that uses paper or gases to absorb and separates gases, liquids and other substances. In this way, the infinite dilution coefficients for a number of aromatic gases were determined. Infinite dilution is useful in estimating what type of solutions will maintain the purity of solutes best. Infinite dilution coefficients reveal the properties of lower quantity solutes, at higher concentrations. This information is important to predict the behavior of several types of chemicals in large water bodies, such as streams and lakes. Additionally, infinite dilution is used in used in industries such as biochemistry and bioengineering to obtain high purity products and remove impurities from solutions.